It’s been a long but rewarding journey, through white, yellow, green, blue and red to reach deputy black. I’ve had doubts, wondered whether my scar-riddled right knee would hold up through the thousands of steps, kicks and blocks. Mentally, the path to black has also been challenging. Would I ever master red belt self defense? And the forms, tiger stance, scissors block and uppercut. They seem to come so easily to so many students but not necessarily to me. After six long months as a high red belt tonight’s exam became more of a mental accomplishment. No, my forms weren’t perfect. I missed one move in Taegeuk juk jong, and the turn of wrist and sidestep I’d worked so hard to master in Taegeuk chil jong didn’t go as well as they had in practice. But black belt masters say that once you reach black belt your true journey is only starting. 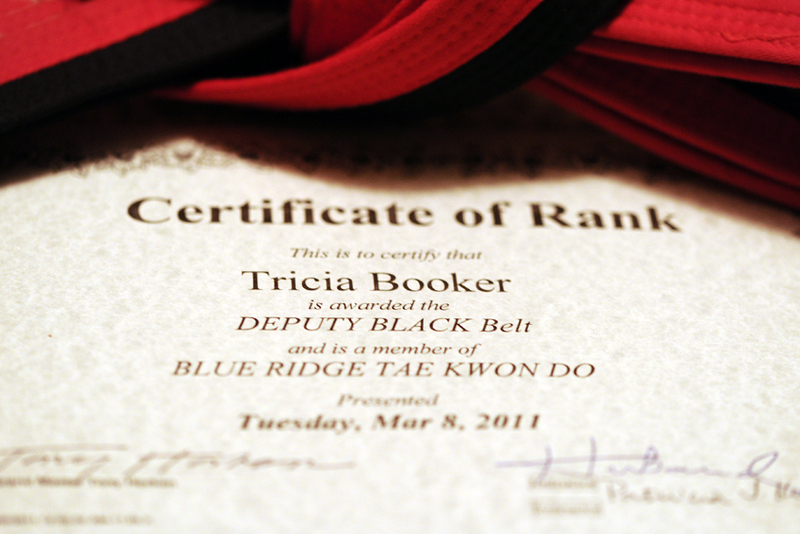 I look forward to the next six months until my black belt exam and will do my best to honor that quest.